This is a classic recipe. My Maw-maw made these every year. Now it is a mainstay in my canning repertoire every year. Figs are a deceptive fruit since it so easily takes on the flavor of whatever you put with it. My true fig preserves have lemon in them so they taste lemony. But these, these take on the flavor of whatever variety of Jell-O I use. Even those fig naysayers (I know, I know, how can anyone possibly say nay to figs?!) 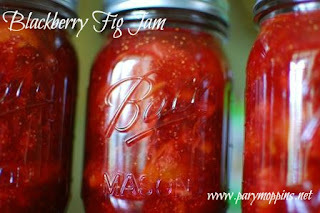 love these preserves and usually don't even know that is what they are eating. In just three ingredients, the humble fig can transform itself into a strawberry, blackberry, or raspberry. It's secret to true identity concealment are its tiny seeds. When the figs get mashed up with the sugar and Jell-O it looks like any kind of berry mushed up. Our favorite is the blackberry but I always make all three variations. As a side note, I am not brand loyal to many things but I AM brand loyal to Jell-O gelatin. Throw everything in a big pot and bring to a hard boil, stirring the whole time. Ladle into hot sterile jars and waterbath for 5 minutes. Your preserves look delicious. My friend has a fig tree and sometimes she shares the fruit with me, I would love to try this out. Thank you so much for sharing with Full Plate Thursday and have a good week! Wow! Thanks so much Miz Helen!